Let’s learn how to monetize your website or a blog! 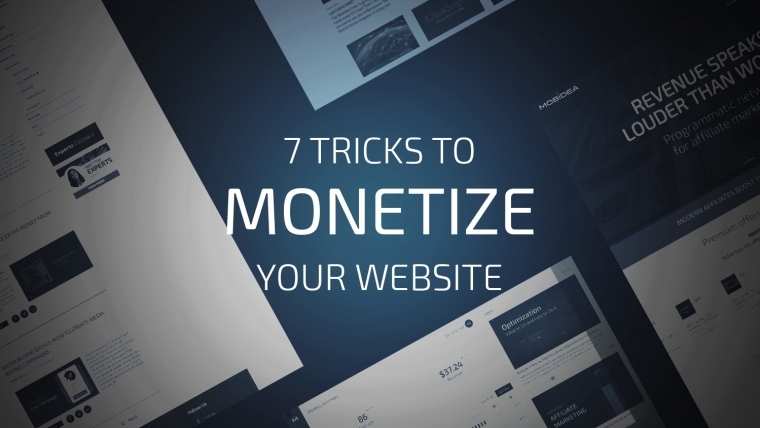 Understand How to Monetize Your Website With These Seven Hacks! The growth of internet technology and the availability of numerous user-friendly platforms has enabled users to create their own websites and blogs in no time. Even if your website or blog is more of a hobby than a business, it’s always good getting to know how you can generate some of that saucy income with it! However, before you get into finding avenues for monetizing your website or blog, it’s important to first quantify your website’s traffic. By doing so, you’ll be able to identify which types of monetizing strategies would work best for you and the best ways to monetize a blog. Google Analytics provides important statistics such as number of page views, specific keywords visitors used to get to your page, and the amount of time users spend on specific pages of your website. Quantcast provides demographic info you can use to gauge which location generates the most traffic to your website. Another important thing you must do is ensure your website/blog has a strong content. This content should not only be relevant and informative for your visitors but should also be optimized for search engines. This will guarantee your website is visible in search engines such as Google, Bing and Yahoo! Once you’ve made sure your website is well optimized, there are several ways you can monetize it. Ready to check some awesome strategies to monetize your website? Now that you’ve launched your website or blog, the quickest strategy you can use to generate money from it is to become an affiliate marketer. This is the simple process of identifying a product or service and endorsing/promoting it on your website. This is key for you to monetize your website! Whenever a user visits your website and clicks on your affiliate link and purchases that particular product or service, you can derive a commission from that sale. This commission can range from anywhere from 30 percent of the product price to as high as 70 percent. This way, you earn some cash without doing any additional work apart from putting an affiliate link on your site. This is how you monetize your website like a sultan! You can even sign up for an affiliate network such as Mobidea! This way, you’ll have the help of amazing media buying experts who have got years of experience in the game and who will help you promote high-converting offers like it ain’t no big deal! Wanna learn about more ways you can go for to monetize a website? Google AdSense is another tremendous source of generating money through your blog. It can really help you monetize your blog. This is a cost-per-click (CPC) program that allows you to put up ads on your website. All you have to do is install the ad code and the AdSense spiders will then determine what your site is about and which ads would fit well with your content. This ensures the ads that appear on your page are relevant to your content. AdSense spiders basically match the ads on the basis of keywords. Every time someone clicks on the ads of your website, you get paid from anywhere between $0.05 to $0.5 per click. What a brilliant way to monetize a website with ads! Another feasible monetization option – and one of the best ways to monetize a website – is to create a website which sells memberships. For this to work, your website must offer some form of value to the customer, whether its digital photos, eBooks, background themes, articles, research reports, etc. There’s a bunch of cool sites that have successfully established themselves such as Shutterstock (images), Elegant Themes (Word Press theme shop), Questia (online library), and Kindle Unlimited (unlimited eBooks for a monthly fee), etc. This has the potential to generate huge revenues for your fat wallet! This may not be as easy as inserting an affiliate link. Even so, it can generate more money for you if you find a direct sponsor for your website or blog. There’s a whole lotta websites that sell advertising space. Prices are generally based on a dollar amount per one thousand impressions (CPM). This can be a fairly lucrative opportunity for websites that enjoy significant traffic and therefore a wicked way to monetize your blog. Making money with a website was never easier! There are many marketers out there who pay bloggers to write positive reviews about their products or services. That’s a cool monetization strategy. In fact, reviews appearing on third-party websites often hold greater credibility as consumers do not view them as direct advertisement. In addition, sponsored content which is informative and interesting is also good for your website as it provides interesting content. How much you can charge for such sponsored content is completely dependent on how popular your website is, how much of a following you’ve got on social media and how effective your content actually manages to be. Want to know more ways to monetize a website? Another great strategy is coming your way! Which one is it, you ask? To write an eBook about the subject area that you’re most familiar with! Then you should sell it directly through your website. It’s an awesome way to monetize your website! This can result in 100 percent profits from the sale price. Since this is digital content, there’s really no upfront cost to it except the amount of time you spend writing it. This strategy is good for those who create a website with the intention of selling it to highest bidder. While this may be a short-term strategy, it works well for those who have multiple websites in a variety of segments and are on the lookout for clients who can purchase the site. However, the slick trick is to make your website worthy enough so it can be appealing to buyers. There are thousands of other strategies you could use to monetize your website through infolinks, widgets, RSS feed ads, premium content, online courses/tutorials, online job boards, consulting services, etc. First, you’ve gotta quantify your website’s traffic and visitor profile. Then, you need to make sure you’ve got strong content. Afterwards, you can try finding the strategy that fits well with your primary content. Hope these tips have given you the monetization bug! I know you’ll be able to take advantage of this post and monetize your blog to the max! You’ll be making a cash cow real soon!